The Fifth Annual Symposium on the Role of Religion and Faith-Based Organisations in International Affairs was held on 29 January at the United Nations Secretariat in New York. The symposium addressed the theme “Financing for Sustainable Development: Towards an Economy of Life”. 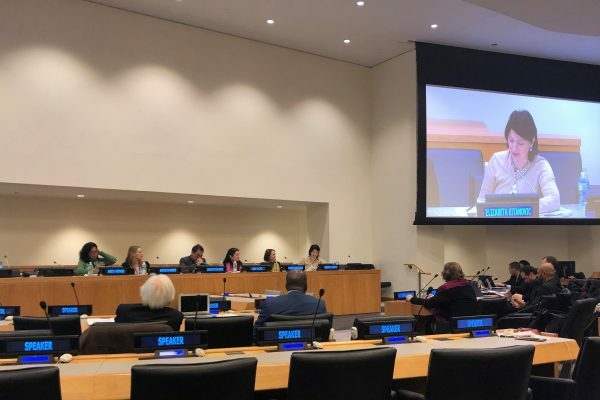 CEC Executive Secretary for Human Rights Dr Elizabeta Kitanovic was a speaker in a session focusing on “Integrating Human Rights in Financing for Sustainable Development”. The panellists addressed the creation of an international financial architecture which promotes human rights, finds solutions to the debt crisis and realises the attainment of the Sustainable Development Goals. The event was organised by ACT Alliance, The General Board of Church and Society of the United Methodist Church, General Conference of Seventh-Day Adventists, Islamic Relief USA, United Religions Initiative, World Council of Churches and was co-sponsored by the United Nations Inter-Agency Task Force on Religion and Sustainable Development and NGO Committee on Financing for Development Conference of NGOs (CoNGO).